Keep your head and hands warm with the stylish Whitewood Beret and Mitts, featured in Interweave Knits Fall 2014! Now available as an exclusive kit, you can select from Light Taupe, Silver, and Dark Taupe yarns! Perfect for cooler weather, the Whitewood Beret and Mitts feature alternating panels of purl-barred keyholes and thick braids. Available in three different colors, you can knit this beret and pair of mitts for yourself. 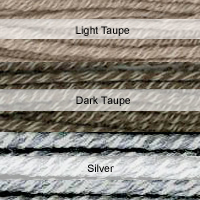 Choose between Filatura di Crosa Zara Chine yarns from Tahki-Stacy Charles Inc. in light taupe, silver, or dark taupe. This Fall issue packs a lot of knitting—cables, collars, pockets, textures, colorwork, lace, and plenty of delightful patterns! With rustic tweeds and luxe blends, the yarns are sure to delight, while a nod to menswear throughout the collection makes for sporty outerwear and tailored classics. 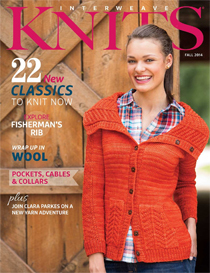 Included in this issue are Robin Melanson’s Whitewood Brete and Mitts patterns. The Whitewood Brete features alternating panels of purl-barred keyholes and thick braids, separated by reverse stockinette. The beret coordinates with the Whitewood Mitts, which use a single panel of the purl-barred cable and smaller versions of the braids at the sides of the hands. These wonderful mitts also, feature a small three button. The finished size of this beret is 20 inches in circumferene at the band, 23¾ inches circumference at widest point and 8 inches tall. The mitts are 6½ (7¼) inches circumference at palm and 5¾ (6½) inches long. Each Kit includes 3 balls of 100% Merino wool, Filatura di Crosa yarn in your choice of Light Taupe, Dark Taupe or Silver. available in Light Taupe, Silver, and Dark Taupe!